5K, 5mile, 10K, 10 mile, Half Marathon, 20 mile etc. on the right side of the table below. These races are entered in the normal way through the host clubs. The entry fee is £5.00, which includes food. 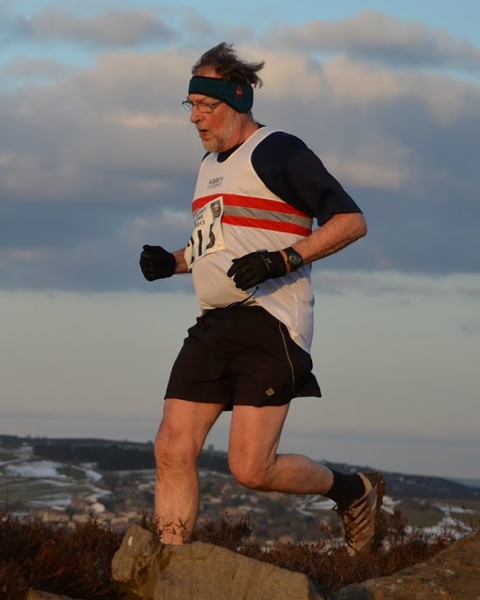 If you have not done one before they are similar to the Kirkstall Trail Race or the Meanwood Valley Trail Race. Below – Bernie Foster representing the Abbey vets at the first Bunny Run on 2nd April. 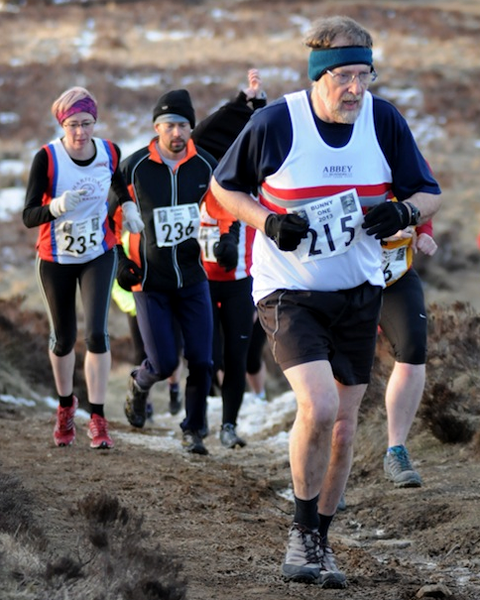 Photos thanks to Woodentops – full race details on their web site. 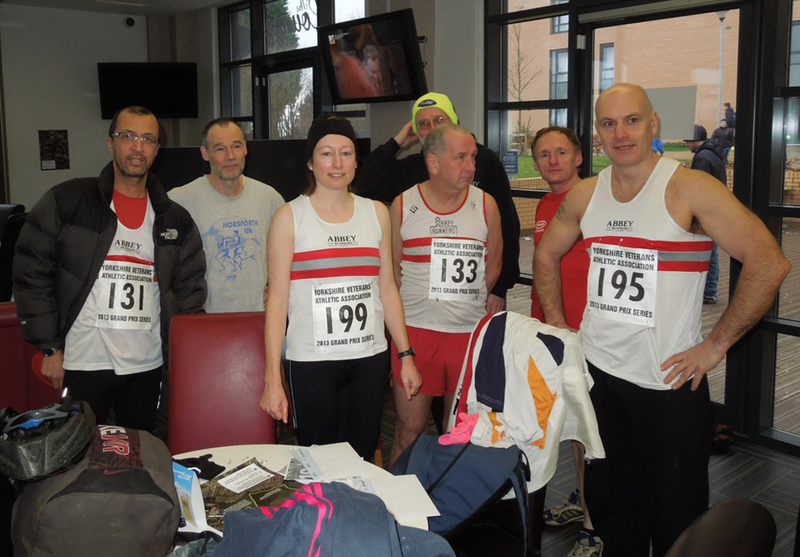 A good performance by Abbey at the first GP race at Horsforth… Below are some of those who took part. Aren’t Vets all grey-haired men with beards and dodgy legs? Certainly not! There might be a few grey hairs lurking in the pack, but most Vets are beautiful, winsome, intelligent and young for their age. And that’s just the men! 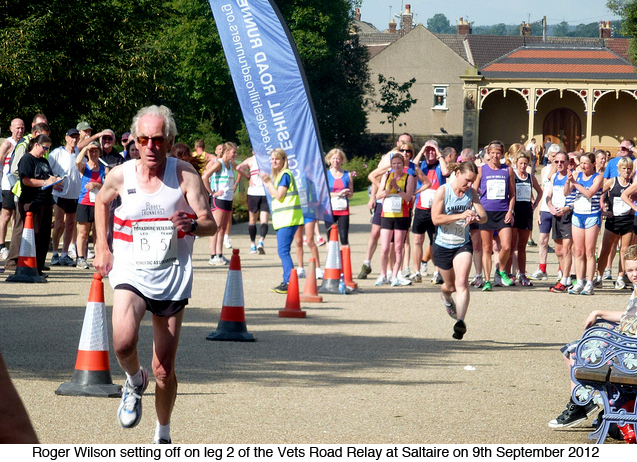 The YVAA are the Yorkshire Veterans Athletics Association. It is the main organisation that caters for Vets in our region (http://www.yvaa.org/). Abbey Runners are affiliated to YVAA; so all Abbey Runners can run in their races. How can I race against other vets? YVAA organise two sets of local races (and even those under 35 can compete as guests). The YVAA Grand Prix is a series of mostly trail races of about 5 miles. Attracting 100 to 200 runners per race, there is a point’s league for individuals and various team leagues. During the summer months, some of these races are midweek. As an added bonus, they are also cheap to enter. Race entry is on the day. The atmosphere is friendly and sociable. The YVAA Championships are a series of races over various distances. The races are mostly open events (entry in advance), so the young ‘uns can also compete. There are road, fell, cross-country, relay and track & field events. Abbey participation in YVAA events was low in 2012, so it would be great to get a few people out to a few more races. Advance notification of events will be posted on this page and also sent out!